SIBO or Slow Gastric Emptying? Check this Out! Do you have SIBO or slow gastric emptying? 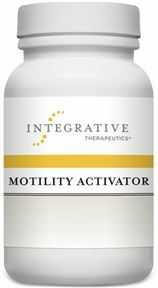 Motility Activator by Integrative Therapeutics is a new prokinetic on the market, that is a must try! Prokinetics (think “pro-kinesis”) help to strengthen the lower esophageal sphincter, speed gastric emptying and they strengthen the migrating motor complex (MMC) – which creates house cleaning waves along the small intestine. These waves help move debris down the track. A prokinetic helps amplify these waves, as well as increases their frequency. These waves occur on an empty stomach, between meals. Bile is also released at this time, acting as a detergent, which helps to clean out the small intestine. To date, supplemental prokinetics included MotilPro by Pure Encapsulations, or high dose ginger. Motilpro contains vitamin B6 6.7 mg (as pyridoxal 5′ phosphate); ginger 1,000 mg. (Zingiber officinale) extract (root) (standardized to contain 5% gingerols) -acetyl-l-carnitine 500mg; 5-hydroxytryptophan 50 mg (5-HTP). At the recommended dosing of 3 capsules 1-2 times daily, a person will ingest 1500-3000 mg of ginger daily. Ginger is a good prokinetic, and it is also an antispasmodic. Ginger contains a compound called gingerols and when dehydrated, some gingerols form shogaols (similar chemical structure to gingerol). The concentration of shogaols, depends on the type of ginger used. Shogaols are more pungent, and really the main component in ginger that gives it its strong pungent qualities. Ginger can cause heat and irritation in the stomach, especially when taken at 1500-3000mg per day. This also adds 6 capsules per day, when a person (based on the need for a prokinetic) is likely on a robust supplement protocol. It can help with PPI weaning and it is also helpful for diabetic patients, who often suffer from some level of gastroparesis, and this slow motility effects their ability to malabsorb nutrients and sugar. At our round table dinner at the SIBO Symposium this year, Allison Siebecker shared her personal and clinical experience with this product – all being favorable. She is personally taking this right now. Clinically I haven’t seen a patient NOT be able to tolerate this and it definitely works to calm and settle down the digestive tract. I highly recommend it! « Is SIBO a Real Condition?